Imagine yourself walking inside a church…Christ-centered, uncluttered, and orderly. Wouldn’t it be beautiful if we could recreate the same atmosphere in our own domestic churches? But aside from living out our vocations as wives and mothers, we have answered Our Lord’s profound call to educate our children at home. While home schooling has its indescribable rewards, it also comes with many challenges. One challenge, I believe, lies in how to provide a simple, holy, and orderly environment so our homes reflect a truly Christ-centered domestic church. 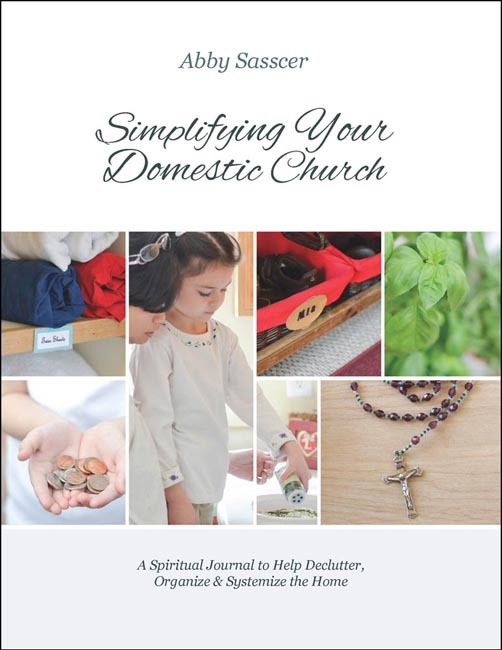 My hope is that this journal will somehow help families declutter, organize and simplify their own domestic churches. See also Simplifying Your Domestic Church Group Study 5-Pack. "Simplifying Your Domestic Church is a must read and read again for anyone wanting to focus on establishing peace and order in the home. Abby Sasscer has been gifted with the ability to eliminate the chaos and clutter in any home, while impacting your spiritual life. Prior to reading Simplifying Your Domestic Church, I was distracted and working harder that I needed to in order to maintain my loose systems. In short, I was frustrated. Abby educates the reader on systems of management that are user friendly. Her systems can be duplicated with ease and will help both that sanguine "stash and dasher" like me ---- as well as the "Martha Stewarts" who will learn detachment from being too organized at the expense of what really matters. This book is as spiritual as it is practical. Loaded with charts,forms, easy to read bullets, quotes from scripture and lives of the saints--- it is just what any homeschooling mom needs. I know I did! Thanks for sharing your gift with us Abby." Ordered this book when it first came out and also spoke with Abby Sasscer on the phone. This book has changed our lives and I don't say that lightly. We have, correction, HAD, so much clutter in our house from moving so much in 20+ years of marriage and living in 8 different places, just bringing clutter from house to house to house and never really getting things organized. I had tried FlyLady and other organizing "helps" but I just couldn't find the impetus to really do it. Abby's book helped me really think of why we have the things we have in our lives, think more deeply about NEED vs. WANT, learn to detach, detach, detach, following the examples of the saints. Thank you, dear Abby, for writing this book. I hope more families buy it and benefit from it. God bless!! Wonderful book, really ! It is as if you wrote it just for me! I had a very busy corporate life and recently realized that we have been accumulating things for the past 12 years! I knew I needed to do something but I didn't know where to begin. I was overwhelmed with household chores and was grappling to make a schedule that will work. When your book arrived, it gave me ALL the guidance and direction I needed. So thank you so, so much! I felt that you really wrote this book just when I needed it the most! May God bless you and your family! This is a GREAT Wedding Gift! "Simplifying Your Domestic Church" can definitely assist the newlyweds in their "new" life. Life as newlyweds it can get easier with this book! And the price it's very reasonable.